This has not been entirely demolished, but pretty much everything that can be peeled off and stolen has been. And it's never coming back. 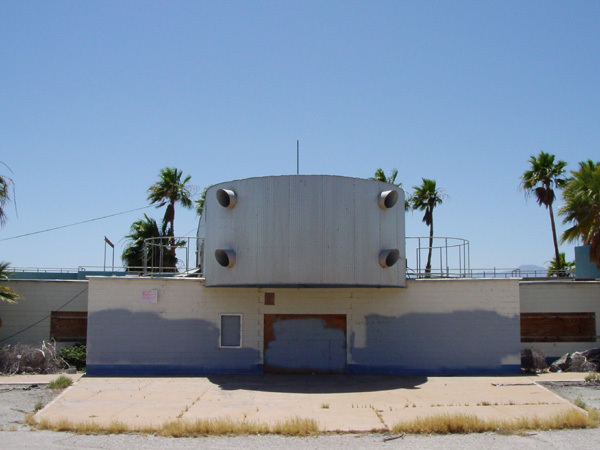 The North Shore Yacht Club was the first Marina to be built on the Salton Sea. Architect Albert Frey designed it for noted Oilman / Gambler / Developer Ray Ryan. It had a good ten-year run before the Salton Sea started to die. Then it too spiraled down to near oblivion, like most other things around the sea. I like this concept of a thread. I see it as a place where we can memorialize lost buildings. I hope people will post additional images and memories to these threads. Last edited by Tony on Tue Jul 11, 2006 5:25 pm, edited 1 time in total. Last edited by MD² on Thu Jul 13, 2006 6:27 am, edited 1 time in total. 5 shows the rear view looking south. You can see to the left that most of the decorative painted "flags" have been stolen from that grillwork. But the distinctive cylendrical window shades are still ther. 1 is a later shot. On this view looking north, most of those flags are still there, but the window shades have been stolen. 3 is later still, now only one flag is left. and 4 is a front view, similar to the situation today. I find it both interesting and sad to see the deterioration over time. Perhaps Dearly Departed was a premature title, as this building still stands. But given that the entire building has been systematicaly looted, and given the present condition, but more importantly - given the economic conditions here, this building will only continue to go down. Thanks for those pictures MD! Last edited by MD² on Thu Jul 13, 2006 6:27 am, edited 2 times in total. Oh, I didn't notice that link in your post, so I didn't look at it or count it. That shot looks pretty recent. I think I even recognize some of the graffiti. What an interesting place to stay that must have been!!! "This world has nothing for me, and this world has everything. All that I could want, and nothing that I need." Now we see a rear view looking south. You can see to the left that most of the decorative painted "flags" have been stolen from that grillwork. But the distinctive cylindrical window shades are still there. This is a later shot, looking north. Most of those flags are still there, but the window shades have been stolen. This is a later shot still, now only one flag is left. And this is fairly recent. I think I even recognize some of the grafiti. And this is the front of the building, very much like it is today. It was 1958 when developer Ray Ryan and Trav Rogers bought the land that is now the town of North Shore. They began selling plots of land for homes and in 1960 began building the North Shore Motel and the North Shore Beach and Yacht Club, which opened in 1962. It was described as a $2 million marine paradise with one of the largest marinas in Southern California. Gladys Fei, publisher of North Shore News, says that for the next decade, North Shore was a "swinging" place. Ray Ryan's oil millions backed a very unique Yacht Club in the middle of the desert. Mrs. Fei says, "This was a very, very popular place. The Beach Boys would come out. And Jerry Lewis had a boat here, and so did the Marx Brothers. There were big boat races, and parties and dances. Clubs and organizations from all over the Coachella Valley came for meetings and parties." Like most of the other locations around the Salton Sea, fluctuating water levels and flooding created problems. In 1981, North Shore suffered from a severe flood which wiped out the jetty at the yacht club, making it impossible for boats to dock there. The main clubhouse was closed and has yet to reopen. Homes dot the hills above the water, their residents either retired or commuted to valley cities for work. The views are spectacular and it remains to be seen whether or not a solution to the high salinity problem will bring back this once glamorous resort. While heading out to the starting point of a 4-wheeling trip last weekend, I happened upon the old yacht club. Wow--what an amazing place, at least once you get past the thousands of bleached tilapia skeletons washing up on the shore. I had no idea at the time I was looking at an Albert Frey design, and I sure wish I could have seen the building in its heyday before many of the structural accents were removed. Knowing the history, now, it is rather sad to see that it has been allowed to deteriorate to this point. Fortunately, it's still in a condition (at least the exterior) that restoration should definitely be possible. North Shore is so amazingly dilapidated that I plan to make another trip out to explore the area again and get some more photos of the abandoned yacht club (next time, hopefully with a better camera). It's definitely worth a visit if anyone is in the area. What is that rusty steel structure that you photographed?